Sometimes the things that everyone seems to accept as gospel don’t always hold true when researchers actually look into them, especially in regards to nutrition. Take the glycemic index for example: Around since the 1980’s, accepted dogma holds that white bread will very quickly raise everyone’s blood glucose levels with a GI score of 73, while a banana gives a slower increase in glucose with a GI score of 48. Turns out that when scientist decided to look at a large group of individuals’ glycemic responses to foods, people’s responses vary a lot from what the glycemic index shows. There have been a couple of good studies over the last couple of years that have shown the huge variation in blood glucose levels in response to carbohydrates. For example, some people may have blood sugar spikes from eating a banana, while others may have their blood sugar drop from eating bread. The individual variation found in the studies is striking. A recent Science Daily article (Is white bread or brown bread ‘healthier’? It depends on the person) sums up another study on the glycemic response of 20 individuals to white bread and to brown bread. Turns out that for about half the people in the study white bread caused less of a blood glucose spike, while for the other half, brown bread is better. One reason for the individual variation is differences in the gut microbes of each individual. The types of microbes in your gut depend on a lot of factors including early childhood experiences, types of food that you currently eat, antibiotic exposure, and also your genes. Why is this important? Diet advice is everywhere — from the doctor on TV to your own doctor telling you to drop a few pounds. But generic recommendations may do nothing for you, and, if your goal is to prevent type 2 diabetes, the recommendations may actually work against you. 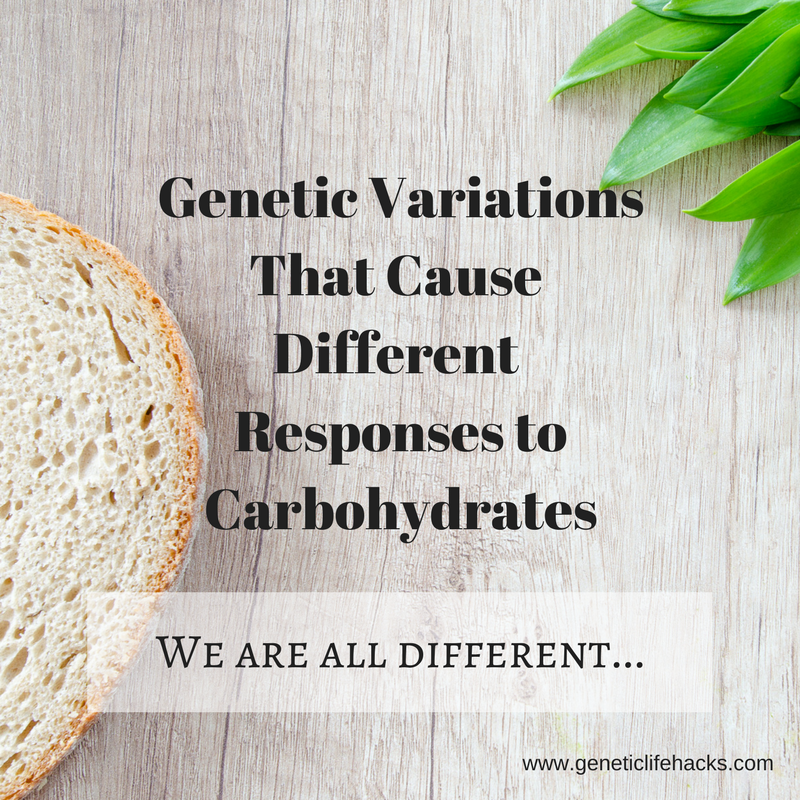 Below are a few genes that affect insulin or glucose levels based on carbohydrate consumption. Variants in UCP3 (uncoupling protein 3) have been linked in many studies to obesity and insulin resistance. One study found that people with one variant had a better response (lower glucose levels, more weight loss) on a diet higher in protein and lower in carbs. Those without the variant lost a little weight on the diet, but it had no impact on their blood glucose levels. Another study on the same variant looked a the response to a reduced calorie, but higher in monounsaturated fat, diet. Both those with the G/G genotype and those with an A allele lost weight, but the G/G genotype lost quite a bit more weight (over 10lbs more on average). Additionally, those with the G/G genotype had improved cholesterol levels and other cardiovascular parameters. The insulin receptor substrate 1 (IRS1) plays a role in insulin signaling. Variants of the gene have been tied to the risk of type 2 diabetes. A large study of over 25,000 people without diabetes looked at the role of an IRS1 variant in conjunction with diet. The results found that for women with the T allele who ate fewer carbs had a lower risk of diabetes; while for men, it was a low-fat diet that, along with the T allele, that resulted in a lower risk of diabetes. The FTO gene has been linked in a lot of studies to obesity and weight gain. A 2009 trial that investigated the outcome of a lower carb/higher fat vs higher carb/lower fat diet found that a variant of the gene was linked to a greater decrease in HOMA-IR (measure of insulin resistance) when on a lower fat/higher carb diet. Variations in circadian rhythms have been shown to play a role in obesity and insulin levels. Studies have shown that the CLOCK gene variants are involved. Switching gears from looking at carbohydrates, a 2013 study looked at two different diets – low-fat diet vs. Mediterranean (high in monounsaturated fat) diet- and the effect of a CLOCK gene variant on the outcome of each diet. Individual response to a diet is not nearly as simple and easy as most diet gurus make it out to be in their numerous books and websites selling supplements. In addition to applying what you’ve learned about your genetics, you may want to quantify your blood glucose levels by using a test kit. Blood glucose test kits are not that expensive and can give you a fairly accurate picture of how your body reacts to different meals.